I'm lucky to be the occasional recipient of Josey Baker experimentations. The other day Josey handed me a still-hot loaf of 100% einkorn bread - substantial, fragrant, a dark brown crumb with a craggy top-crust. It smelled like a great brewery - all malt, and grain, and warmth. And it begged to be treated right. The first question to come to mind was slicing strategy...the consensus was: 1) Allow the bread to cool completely. 2) With this loaf - not too thick, not too thin. Not to digress too much, but when it comes to toast, the thickness or thinness of the slice is key. Some breads lend themselves to a thick slab - Blue Bottle Cafe (in downtown San Francisco) cooks an egg-in-the hole of Acme's pain de mie. Perfect. There are other breads I like thinly sliced and extra-toasted - Josey's rye comes to mind, also Anna's Daughters' Rye - a beautifully distinctive local bread. Once this was sorted, Josey got on with his afternoon, and I started thinking about what I'd eventually put on the bread. Silvena Rowe's book had been in my bag for a few days, I was reading it when I was on the bus, or waiting on a coffee. 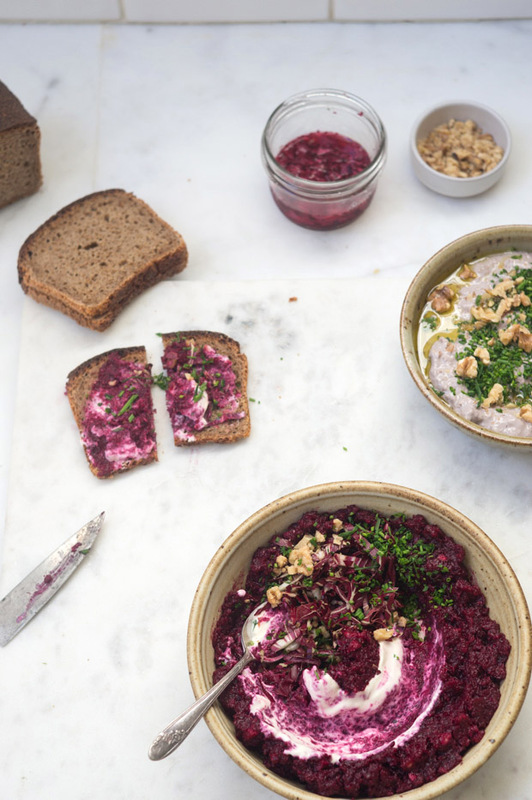 So I started paging through, and settled on a beet spread I knew would be beautiful - the sweet earthiness of the roasted beets accented with toasted walnuts, chives, dates, a bit of booziness, and a swirl of creme fraiche. Silvena has written a couple of other books I have in my library - I suspect a good number of you might find them inspiring as well. I first purchased Purple Citrus and Sweet Perfume: Cuisine of the Eastern Mediterranean, and then Orient Express: Fast Food from the Eastern Mediterranean. 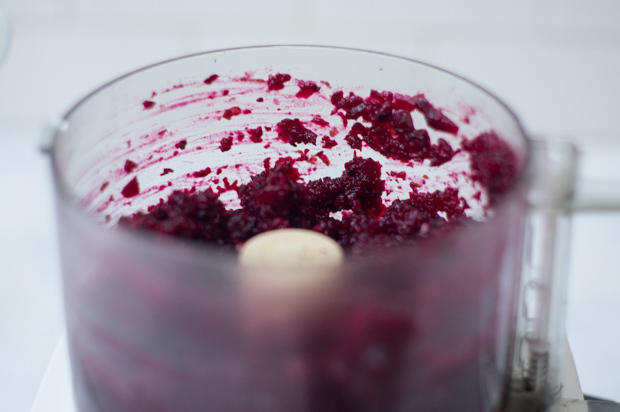 The beet caviar was a nice accompaniment to the einkorn, and I imagine it would be brilliant as a spread or dollop on just about anything - from toasted pita, to a harvest soup. A swirl would be nice in risotto, or as part of a mezze spread. Enjoy! 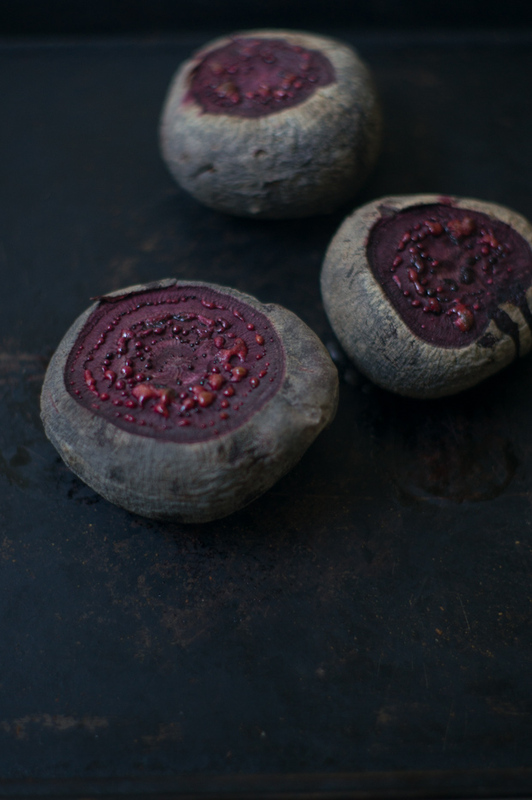 When the beets are cooked and cool enough to peel, remove the skins and chop into cubes. 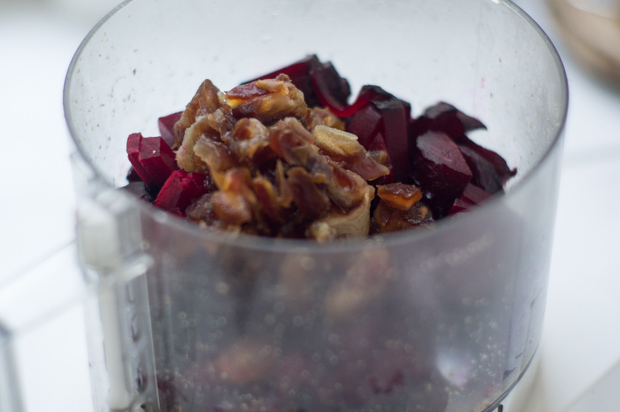 Place in a food processor with the dates, cognac, and garlic. Puree until the texture is to your liking - I left a bit of texture here, but you can go smoother if you prefer. Transfer to a serving bowl before adding the lemon juice, walnuts, and salt. Taste, and adjust the seasoning if needed. Serve swirled with the creme fraiche, and finished with chives. Adapted from The Eastern and Central European Kitchen: Contemporary and Classic recipes by Silvena Rowe (2007).